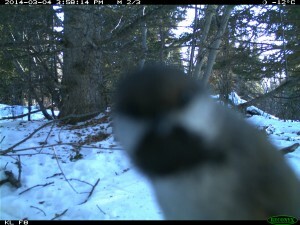 A photo-bombing boreal chickadee checking out a trail camera set up in the Yukon by Jessica Haines. This entry was posted in birds, Field Fun, Kluane Red Squirrel Project, trail cameras by jahaines. Bookmark the permalink.